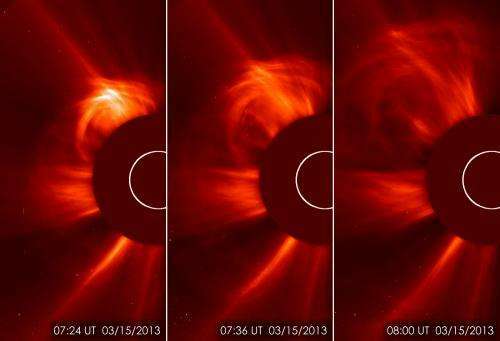 (Phys.org) —On March 15, 2013, at 2:54 a.m. EDT, the sun erupted with an Earth-directed coronal mass ejection (CME), a solar phenomenon that can send billions of tons of solar particles into space and can reach Earth one to three days later and affect electronic systems in satellites and on the ground. Experimental NASA research models, based on observations from the Solar Terrestrial Relations Observatory (STEREO) and ESA/NASA's Solar and Heliospheric Observatory, show that the CME left the sun at speeds of around 900 miles per second, which is a fairly fast speed for CMEs. Historically, CMEs at this speed have caused mild to moderate effects at Earth. a CME is a solar phenomenon that can send solar particles into space and reach Earth one to three days later. Earth-directed CMEs can cause a space weather phenomenon called a geomagnetic storm, which occurs when they connect with the outside of the Earth's magnetic envelope, the magnetosphere, for an extended period of time. And in one to three days, expect some of this energy to be imparted upon the Earth and be on the look out for increased geologic and extreme weather activity. Co-incidentally, I felt a distinctive electrostatic shock that kind of clicked in the back of my head, night before last, while lying in my bed. I thought that North Korea had finally carried out their threat for a pre-emptive nuclear strike and looked for a news story in the morning, but, nothing. I now theorize that I must have felt the shock wave of the event that produced that mass coronal ejection, vindicating the thesurfaceofthesun.com's theory that the sun's energy fields are electrical in nature, and not magnetic, which is the current paradigm. Here cantdrive, this is a running tally of global earthquakes 2.5 and above for the last 7 days. It is updated every minute. Let us know when you see the increased geologic and extreme weather. I'm very familiar with that site, I would suggest filtering out quakes 5.5 and below. I'll admit the weather activity will be difficult to confirm, there are countless ways this can materialize. There are however quite a few correlations between EF-5 tornadoes and solar activity (see Joplin 2011, Alabama 2011 outbreak). Changed weather would be one effect but then if Nassim Haramein is right it may be much much more. The article on the NASA site states, "On March 15, 2013, at 2:54 a.m. EDT, the sun erupted with an Earth-directed coronal mass ejection (CME), a solar phenomenon that can send billions of tons of solar particles into space and can reach Earth one to three days later"
If so, how many pounds of solar particles will actually reach Earth?